Teeth whitening has become a kind of trend because the brilliant smile and healthy teeth have become an aesthetic imperative of the modern age especially with Hollywood stars. People with white teeth look younger so popularity of this method is not unusual. Dentists often use the term "Hollywood teeth" that more or less became unique in their profession. In this article we will give you useful tips for natural teeth whitening and we hope that we will give you an answer to the frequently asked question these days, which is to say – how to achieve white teeth? Before we start with recipes from nature, it is up to us to write that this problem is solved by modern and aesthetic dentistry. It has found a way to please patients, so using various chemical (not cheap) treatments such as teeth whitening by lasers to achieve brilliant white teeth , but their effect lasts only a few months due to nutrition, the operation of various beverages, and especially smoking of cigarettes and tobacco. Teeth whitening agents, especially those that achieve the immediate effect, can damage teeth and accelerate the formation of caries. But some foods and medicinal herbs can help teeth in a natural way, and make them brighter by a few shades. The color of the tooth mainly depends on the color of dentine and varies from blonde-white to dairy to yellowish-white on permanent teeth. The color change comes under the influence of various factors that affect the development and emergence of both milk and permanent dentition - metabolic disorders, as well as the structure and mineralization of teeth, jaundice in newborns, congenital heart defects. Transient dental vision and dark teeth are due to the effects of pigments from food and drink, as well as nicotine, some drugs, but also because of aging. You should avoid or minimize the consumption of soy, coffee, wine and some teas. If you cannot make it without drinking some of them, drink them on a straw. Experts say it is desirable to eat vegetables that clean your teeth, such as beans, cauliflowers, carrots and celery for a brilliant smile. These foods not only mechanically brush your teeth while chewing, but they also stimulate the secretion of saliva that helps neutralize the acid and protect against the toothache. Milk products with high content of calcium, especially hard cheeses are great as they remove food particles, help teeth be healthy and white. In addition, such food contains lactic acid that prevent tooth decay. There are many natural fruit products that whiten teeth such as lemon bark, banana bark, strawberries, apples and apple cider vinegar, as well as miswak tree about which we will talk a little bit later. Teeth whitening with lemon is not a novelty, namely rubbing teeth with lemon peel cleans deposits of caries and bleaches their surface. However, this should not be overdone because frequent use of lemons can greatly damage your teeth. Apply this method at most once a month. For teeth whitening at home, you can also use the banana peel. With the inside of banana peel, rub your teeth once or twice a day for a few minutes. The effect is visible already in about ten days after the application of this natural method. 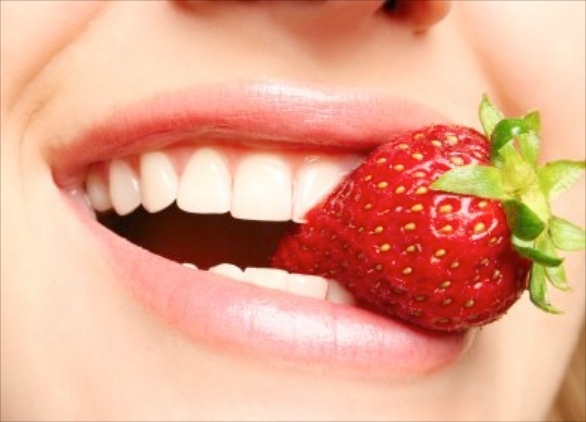 Strawberries are also very effective in teeth whitening: they need to be crushed, and then brush your teeth with the mixture - it will strengthen and bleach them. Apples contain acids that will naturally remove stains from the teeth and thus maintain their whiteness. For this reason, instead of chocolate and chips, eat this fruit. Apple vinegar removes stains on your teeth, so you can use it instead of a mouthwash for several days. Miswak is a tree that the Arabs have used since ancient times to clean their teeth, and more recently it is recommended by the World Health Organization (WHO). Particles of this tree are soaked in rosé water to soften up, and then are used to rub gently your teeth - after each meal, in the morning and in the evening. While looking for an answer to the question on how to whiten your teeth at home, we have come across this excellent recipe from Dr.Neumivakin - who is a doctor of medicine. Its tooth whitening paste helps with caries and it is effective for treating the gingivitis, inflammation of the gums, paradentopathy and eliminates unpleasant smell from the mouth. Add 1/2 to 2 teaspoons of baking soda to 10 to 20 drops of pharmacy hydrogen peroxide and a couple of drops of lemon juice, and the toothpaste for the whitening of teeth is ready for use. It is necessary to soak a cotton wool in it and apply it from all sides. It's best to treat your teeth in the morning and evening before you go to bed. Your mouth and teeth will be at a much higher health and you will soon notice your brilliant smile that will definitely improve your mood and restore confidence. It's important to note that all three ingredients in the toothpaste are extremely effective. As a disinfectant for your mouth and rinsing, you can use 3% hydrogen, dissolved in 1/2 deciliters of lukewarm water. We hope that the article for natural tooth whitening at home was good for you and that you will share it with your friends!